As a discerning homeowner, you may already know exactly what you want for luxury vinyl tile floors in your home. Make the smart choice when it comes to purchasing luxury vinyl tile flooring and stop by our flooring store to peruse our stunning collections. When you come and browse our showroom, you are going to be able to enjoy an endless amount of options for fabulous flooring at very affordable prices. Even better, our team is able to perform any LVT flooring installations you require to ensure your new floors are installed the right way the first time. More and more people are choosing vinyl tile and planks to grace their homes. With vinyl, you receive long-lasting floors that are a breeze to clean up in a large selection of styles and colors. Additionally, when you buy a luxury vinyl tile floor, you are getting a stylish, durable, long-lasting, and cost-effective product. Selections from our store are also resistant to stains, water, and dents. These products beautifully mimic higher end flooring at less cost. Ceramic vinyl tile adds polish and style to your home. 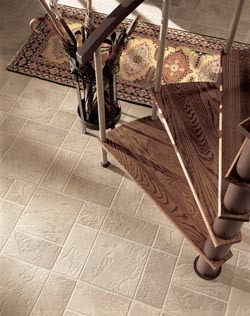 The stone vinyl tile squares we offer deliver the majesty of mountain without the expense. Our wood vinyl tile provides you with the warmth and elegance you want without harming any trees. Whichever type of luxury vinyl tile flooring you choose, you are able to properly transform your home into the stunning space you have always wanted while staying on budget. Additionally, our luxury vinyl tile floor options make your life easier thanks to their durability and easy upkeep. When you step inside of our flooring store’s impressive showroom, you will see exactly what we are talking about when we talk about our impressive selection. Easily browse through all of the different samples we have out for you and take your favorites home so you can match them with your décor to ensure everything comes together just as you want. Make sure you learn more about two of the most respected names in the flooring manufacturing business by speaking to one of our showroom specialists about our Downs® and Naturcor® luxury vinyl tile floor and planks. Besides offering you durability and quality, Downs is one of the easiest floors to install due to its unique click system of fitting vinyl tiles and planks together. Use Downs in any room of your house with ease thanks to its ability to stand up to water while remaining flat. These floors are also able to easily handle heavy traffic thanks to their hard surface. Imagine all of the best qualities of flooring combined into one. This is Naturcor. This brand of luxury vinyl tile flooring and planks offers cushiony comfort beneath your feet with resilience that stands up to wear, tear, and water. Plus, it has all of the appeal of ceramic, stone, and hardwood flooring options. Best of all, it comes in four low price points that are as nice to your budget as they are to your home’s aesthetic. Picking out the right type of flooring for your home is only the first step. You also need to make sure that the flooring is installed correctly by a professional to ensure you are getting the most functionality out of your new floor. By working with an amateur, you can end up with issues that can cost you extra money to fix while lowering the overall appearance of your home. This isn’t an issue with our LVT flooring installation services. Our team is super familiar with the flooring options we sell, which means we can install everything the right way the very first time. This helps you save time, money, and frustration when having your new floors installed. Contact us if you are interested in learning more about the luxury vinyl tile flooring available from our store. Our team provides products and services to customers in New Hyde Park, Floral Park, Great Neck, Manhasset, and Long Island, New York, as well as the surrounding areas.